Hiromi Uehara (???? 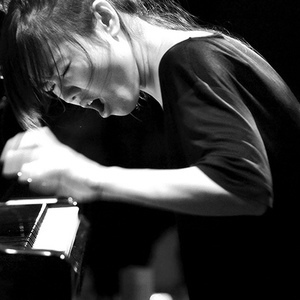 ?, born 26 March 1979) is a Japanese jazz composer and pianist. She is known for her virtuosic technique, energetic live performances and blend of jazz with other musical genres such as progressive rock, classical and fusion in her compositions. She performs as a trio alongside bassist Tony Grey and drummer Martin Valihora. On October 19, 2006, the trio added guitarist David Fiuczynski (from the Screaming Headless Torsos), to form Hiromi's Sonicbloom. Hiromi first mesmerized the jazz community with her 2003 Telarc debut, Another Mind. The buzz started by her first album spread all the way back to her native Japan, where Another Mind shipped gold (100,000 units) and received the Recording Industry Association of Japan's (RIAJ) Jazz Album of the Year Award. Her second release, Brain, won the Horizon Award at the 2004 Surround Music Awards, Swing Journal's New Star Award, Jazz Life's Gold Album, HMV Japan's Best Japanese Jazz Album, and the Japan Music Pen Club's Japanese Artist Award (the JMPC is a classical/jazz journalists club). Brain was also named Album of the Year in Swing Journal's 2005 Readers Poll. In 2006, Hiromi won Best Jazz Act at the Boston Music Awards and the Guinness Jazz Festival's Rising Star Award. She also claimed Jazzman of the Year, Pianist of the Year and Album of the Year in Swing Journal Japan's Readers Poll for her 2006 release, Spiral. Hiromi continues her winning streak as Hiromi's Sonicbloom with the 2007 release of Time Control and her 2008 release of Beyond Standard. Hiromi took that intuitive approach a step further when she enrolled in the Yamaha School of Music less then a year after her first piano lessons. By age 12, she was performing in public, sometimes with very high-profile orchestras. "When I was 14, I went to Czechoslovakia and played with the Czech Philharmonic Orchestra," she says. "That was a great experience, to play with such a professional orchestra." "It expanded so much the way I see music," she says. "Some people dig jazz, some people dig classical music, some people dig rock. Everyone is so concerned about who they like. They always say, 'This guy is the best,' 'No, this guy is the best.' But I think everyone is great. I really don't have barriers to any type of music. I could listen to everything from metal to classical music to anything else." Among her mentors at Berklee was veteran jazz bassist Richard Evans, who teaches arranging and orchestration. Evans co-produced Another Mind, her Telarc debut, with longtime friend and collaborator Ahmad Jamal, who has also taken a personal interest in Hiromi's artistic development. "She is nothing short of amazing," says Jamal. "Her music, together with her overwhelming charm and spirit, causes her to soar to unimaginable musical heights." At 26, Hiromi stands at the threshold of limitless possibility, constantly drawing inspiration from virtually everyone and everything around her. Her list of influences, like her music itself, is boundless. "I love Bach, I love Oscar Peterson, I love Franz Liszt, I love Ahmad Jamal," she says. "I also love people like Sly and the Family Stone, Dream Theatre and King Crimson. Also, I'm so much inspired by sports players like Carl Lewis and Michael Jordan. Basically, I'm inspired by anyone who has big, big energy. They really come straight to my heart." Hiromi's official website is located at http://www.hiromimusic.com.